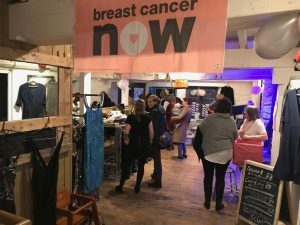 South Hams ladies helped raise £543 for Breast Cancer Now in the space of three hours, at the first-ever Sustainable Shopping event of its kind, hosted in Totnes on Thursday 28th March. Popping up between 6pm – 9pm at Coffee Couture in the town centre, the event took place as part of fundraising efforts by a local young woman. Laura Quick, from Totnes, will be attempting her first marathon in London this April on behalf of Breast Cancer Now. Guests were able to delve into a selection of one-off finds, participate in a lucky dip with a medley of beauty gifts and have the chance to win a variety of raffle prizes – with live music provided by local musician and Laura’s brother, Harry Quick. All proceeds from the event, both from sales of donated clothes and the raffle prize draw, will go directly to the charity ahead of the 26.2-mile challenge, which will take place one month after the charity fundraiser on the 28th April 2019. 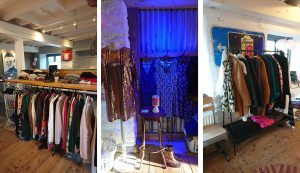 The local bar and coffee shop was transformed for one night only in a vintage-esque clothes emporium, with all hands-on deck to help from friends and family. A flurry of clothes were donated for the event, after local women gave wardrobes an early spring clean. Laura said: “We want to say a huge thank you to everyone that came to the event and to everyone that took the time to go through wardrobes and make it possible in the first place. We are so grateful to local businesses for all the donations to the raffle, as the amazing line up of prizes definitely helped spur on purchases! Organisers where overwhelmed with the support from local businesses who kindly donated prizes to the raffle, including – Eco Laundry, Dartmouth Ice Cream, Moved to Move, Dart Marina Hotel & Spa, Bayards Cove Inn, Lovely as It Seams, local artist Becky Bettesworth, Austin’s Department Store, Boots in Newton Abbot, Vincent Trading, Hill House Nurseries, Woolston Accounts, Gem Rose Hair, The Design Sheppard, Liten Hem, Food for Thought and London based designers Fee Greening and Luke Edward Hall. The Totnes Elizabethan House & Museum is due to re-open for the season on Monday 8th April with some interesting exhibitions appealing to all ages scheduled for the year. From opening day until 25th June, the Totnes Women’s Voices exhibition will celebrate 100 years since at least some women won the hard fought for the right to vote in a general election. This exhibition features the audio/ visual presentation “Totnes Women’s Voices 1918-2018”. In it, you will hear local women and girls from age 3 to 92 give their views on politics and voting, how life has changed and what they feel still needs to change. You will also learn about local women activists from Totnes and Devon who were involved in the suffrage movement and there will be an opportunity to share your views. From 3rd July – 1st October the exhibition will switch from political to technological when the public is invited to meet “Eric”, a mini replica of the first ever British Robot constructed in 1928 by Captain WH Richards from Totnes. This replica has been specially built for Totnes Museum. In 1928 at the Royal Horticultural Hall London, to great astonishment instead of the anticipated Duke of York, the original Eric rose to its feet and gave a four-minute address to open an exhibition. In the 1930s Captain Richards built another robot, this one called George. They toured the world where George gave speeches in several languages. Totnes Museum is very pleased to have won a Place of Science award from the Royal Society to put on this exhibition about WH Richards and his pioneering work. Alongside the exhibition, Plymouth University Robotics department will be offering workshops for our schools and the museum will be hosting a discussion on the ethics of artificial intelligence. 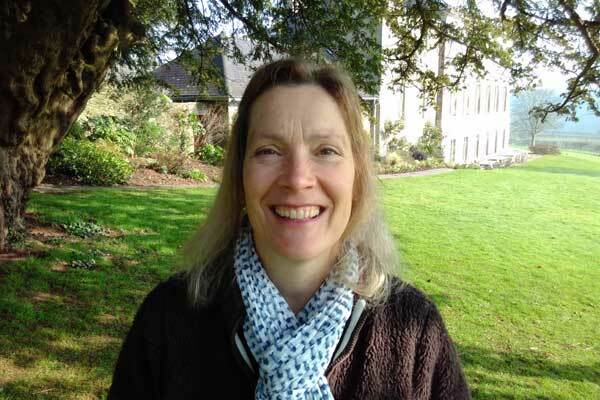 More South Hams schoolchildren and families will get to experience the special environment of The Sharpham Estate, now that there is a new Education and Events Coordinator at The Sharpham Trust. Lisa Carnell will be encouraging Totnes and Torbay primary schools to visit the Estate and learn about its rich wildlife and habitats. And as a biologist, botanist and trained teacher, she’ll be sharing her own extensive science and environmental knowledge by leading some of the activities on the visits. Prior to this role, she was Education Ranger at the Torbay Coast and Countryside Trust for 17 years, coordinating schools’ visits. Her post has been funded for a year by the Ernest Cook Trust, a charity promoting learning from the land. In that year, Lisa will be putting on 10 nature days for local schools. 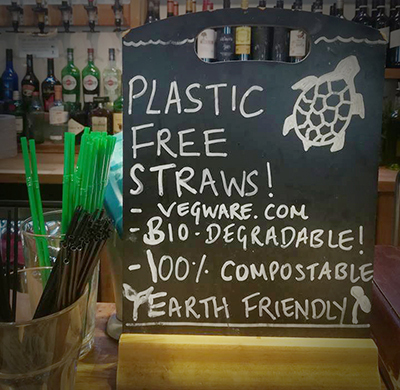 Ben’s Farm Shops are always on the lookout for solutions to tackle the single-use plastic issue and here’s another one that they hope is going to prove popular with customers. 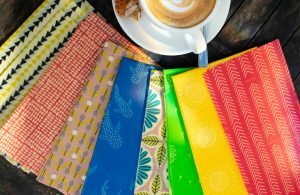 If you’re looking for an environmentally sustainable alternative to clingfilm without the bulkiness of Tupperware, then these organic cotton and beeswax food wraps will be right up your street. These colourful little numbers come from Cambridge based supplier Bee Bee wraps. Bee Bee is the brainchild of Kath Austin,who, inspired by a conversation with a friend (and the fact that cotton and beeswax has been used as a food wrapping tool for centuries) started experimenting in her kitchen with various formulas until she hit upon the perfect one…and the Bee Bee wrap was born. Simply made from organic cotton, beeswax, tree resin and organic jojoba oil, the wraps are completely compostable but if cared for properly, each wrap will last at least a year. They are breathable and won’t cause food to ‘sweat’, therefore increasing the shelf life and cutting food wastage to boot. 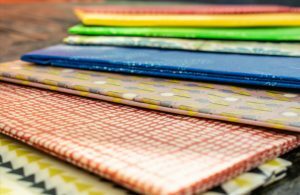 Bee Bee uses low impact dyes and is confident that, whilst the wraps have a beautiful ‘beeswaxy’ scent, this does not taint food at all and does fade with use. To care for your wrap and get the very best from it, hand wash in cold water and ensure any food to be covered is cold before doing so. Bee bee wraps are not suitable for use in microwaves, dishwashers or washing machines and you should avoid wrapping raw meat and fish in them. They are very malleable when warm so use warm hands to mould them and create a breathable seal around your food – once they have cooled down they will hold their shape. The wraps are available from any Ben’s Farm Shops. Plastic pollution is a global problem that is growing exponentially due to both an increase in consumerism and an increase in the number of plastics used to manufacture the things we use on a daily basis. Many of these items are single-use items, which are used once and then tossed in the trash. But what happens to this plastic once the trash can gets emptied? It doesn’t simply disappear into thin air. It usually ends up in the environment in some manner or form, with a great deal of it eventually ending up in the ocean Arguably one of the most pressing environmental challenges that we are faced with today is marine plastic debris. ocean-based, which includes garbage disposed at sea by ships and boats, as well as fishing debris, such as plastic strapping from bait boxes, discarded fishing line or nets, and derelict fishing gear. While discarded fishing gear takes its toll on the marine environment by entangling marine life and destroying coral reefs, it only comprises an estimated 20% of all marine debris – a staggering 80% of all marine debris stems from land-based sources. This is not that surprising, considering that around 50% of all plastics are used to manufacture sing-use items which are discarded soon after they are first used. How Can We Solve Plastic Pollution? We need to tackle the problem of marine debris head on. It’s not just an issue for environmentally conscious, it is an issue that ultimately affects human health. Man is a top predator that feeds on a variety of ocean fish, shellfish, and other marine species. We face the same risks as the killer whale and polar bear. While any plastic or polystyrene pellets that may have been clogging the gut of the fish that is nicely presented on our dinner plate have been long removed, the toxic contaminants originating from that debris remain stored in the flesh we are about to eat. Food for thought indeed. Once again, Totnes has been mentioned in the Guardian newspaper – listed as one of the ’10 of the best small UK towns for winter breaks’. Easy to get to by mainline train, the article goes on to mention how Totnes has a glut of independent shops & cafes than any town of comparable size. You can read the article in full here. Totnes Pavilion Leisure Centre has seen many changes in the last twenty months with these being extremely positive in the last six months. They are offering you a chance to register for a free day pass so that you can try the facilities for yourself and find out more about what they have to offer. Before the current management structure under Fusion Lifestyle was agreed in 2017 the site was being managed by two separate organisations. The Pool, Gym and Sauna by Totnes and District Swimming Pool Association (TADpool) and the Reception, Sports Hall, Dance Studio, Meeting Room, Tennis Courts and outdoor pitches by Tone Leisure Ltd. Even prior to 2006 the site had been under the control of TADpool and South Hams District Council. Despite the dual management arrangement having many positives over a number of years the flaws in the partnership started to show. A combined approach under the management of one organisation was the ultimate solution which has now enabled a longer-term business plan to be activated allowing some previously hard to come by investment. Fusion Lifestyle, a London based not for profit organisation with over 80 sites in their portfolio, were contracted to take on the management of the site and to draw up plans for updating the facilities. This has led to the following investments so far with the expectation of more to come in a phase two development (tbc). Article by Kate Philbin at the Totnes Times. 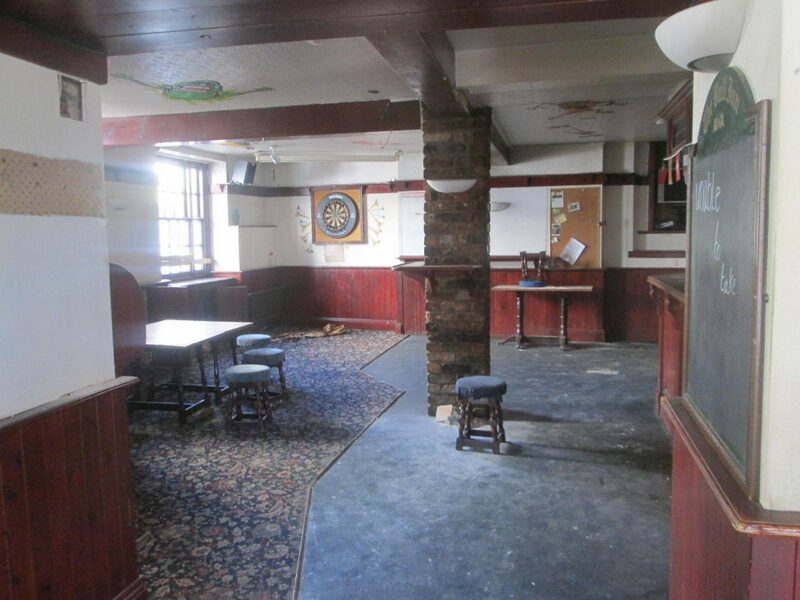 As the planning application was submitted for the transformation of a historic town centre pub, the woman behind the plans has been speaking out about her extraordinary life. 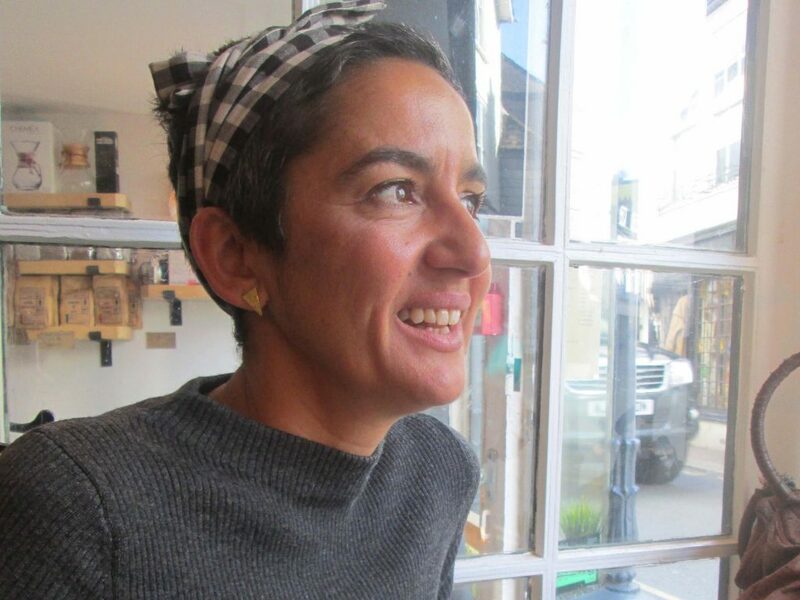 Geetie Singh-Watson, 48, known to many as the wife of Riverford entrepreneur Guy Watson, is the driving force behind the redevelopment of The Bull Inn in Totnes which aims to become an organic gastropub with letting rooms upstairs. However, it is not an extension of the Riverford empire but a project in its own right and it is hers and hers alone, Geetie insists. She says that people assume The Bull will be run by Riverford or is being financed by Riverford but actually it is neither. Raised on a commune in Herefordshire by a mother who was a builder, Geetie was no stranger to hands-on manual work from an early age. Her mother, Liz Singh, bought and restored a derelict cottage, installing everything from the sewage system to the windows. She was “a powerful role model” for Geetie as was her father, Gurmukh Singh, a Sikh entrepreneur who first came to the UK in the 1950s. He founded the first Indian restaurant in London that was owned by its staff. One of its backers was Salman Rushdie. Later, her mother remarried and her stepfather, Geoff Petty, an educationalist whose work is used to this day by schools such as Totnes Progressive School, also proved a great role model. At the age of 28, Geetie opened her first “values-driven gastropub”, The Duke of Cambridge in Islington. Inspired by her hardworking parents and the example set by women like Anita Roddick, Geetie was determined to create a thriving pub business that was both ethical and profitable, without compromising on staff welfare or the quality of ingredients. Geetie sold The Duke of Cambridge to Guy Watson four years ago. At the time she was a trustee of the Soil Association and a founder member of the London Food Board with Ken Livingston. She was also working with schools in deprived areas to teach children about healthy cooking. When she met Guy it wasn’t exactly a match made in Heaven. he was extraordinary.” They married in 2014. Geetie spent three years running The Riverford Field Kitchen but stopped to concentrate on developing The Bull. Transition Town Film Festival 18 VISIONING THE FUTURE is our fourth film festival. We have an amazing array of new or rarely seen films with real power and importance for our lives and communities – about climate change, our food, our politics, our environment, our wildlife – and our future. For the first time, the festival is being held over five days at three cinemas. At the Totnes Cinema there are three showings: Faces Places, Agnes Varda’s latest film and Ai Weiwei’s Human Flow, as well as a poetry, film and music event with Matt Harvey and jazz group Shadow Factory. Plus FREE cafe style screenings of short films by the Next Generation. The Barn Cinema at Dartington shows Bruce Parry’s Tawai as well as Albatross, revealing the effects of plastic on albatross chicks. At the Civic Hall The Worm is Turning charts the effects of chemical agriculture in India and In our Hands explores the idea of food sovereignty. Disturbing the Peace follows the transformation of Israeli and Palestinian fighters, from soldiers to peace activists. Power Trip highlights how media and lobby groups shape the public perception of fracking. Saturday evening honours the life of filmmaker & ocean conservationist Rob Stewart with Revolution followed by the UK PREMIERE of Sharkwater Extinction, which investigates the corruption of the pirate fishing industry. Just 37, Rob tragically died while making this film; his work highlights the environmental threats posed to the oceans & the world and the ways in which young people are helping to find solutions. In the centenary year of some women getting the vote in the UK over half our films are F-Rated: a classification for any film directed or written by a woman. What Tomorrow Brings observes one year at a girls’ school in an Afghan village. The Barefoot Artist chronicles Lily Yeh, a community artist in troubled areas. Nearer to home, 9 of our 13 shorts by young people carry the F rating. Most screenings offer discussion time with film-makers or local experts, including Rob Hopkins, Jacqi Hodgson and Guy Watson. Plus there are four free workshops for children and adults. We are very excited about our programme. Check out our website www.transitionfilmfestival.org.uk and make it a date to come and join us! Bus customers across the South West are set to benefit from faster boarding thanks to the roll out of contactless technology. The new contactless payment system has been installed in over 380 Stagecoach South West buses, speeding up boarding times and taking away the need for customers to carry and pay with cash. Stagecoach South West is celebrating the launch of the contactless payment system with fun events across Devon and the chance to win an Amazon Echo Spot. A giant ‘loop game’ will be set up at a number of locations in the half-term holidays. The quickest ‘contactless contender’ will win the prize and be crowned ‘best in the south west champion’. There will be a chance to win prizes and find out more about contactless payment. The contactless payment system allows customers to pay with their debit or credit card, or apple and android pay, securely and quickly at the start of the journey. The Hop Club at the Lion Brewery has been enlisting locals as hop farmers for 2 years now with 2018 being the third harvest supplied by the community. A delicious, speciality beer is created from the harvest, with some of the beer being given back to those who supply the produce. In 2016 the total harvest amounted to 1.3kg, which increased by a staggering 1150% in 2017 resulting in 15kg of fresh hops. The total hop harvest for 2018 was just over 15kg and would have been 20kg but sadly two of the biggest growers were unable to pick. The produce is brought to the Lion Brewery in a variety of vessels from little bags and tea cups to anything up to large bin bags. The hop plants are covered in hop cones which if teased apart will produce a yellow powder running down the middle called lupulin, which is the magic ingredient needed by the brewery to create the beer. ‘Local Hero’ is the name of the once-a-year brew which is created using the community hops in time for the Forking Local Food Festival on Vire Island on October 8th. The batch also uses local ingredients including 10% of the mash being pea flour from the brilliant Grown in Totnes. If you haven’t harvested before and you’re interested in getting involved next year, contact the Lion Brewery for tips and advice. Su Carroll looks at the changing focus on food at Dartington. In 1925, Leonard and Dorothy Elmhirst bought the run-down Dartington Estate near Totnes. They were visionaries who began what they called the “Dartington Experiment” – bringing together other like-minded, creative people for education and inspiration. In the early days, the couple spearheaded changes to the estate – Schumacher College, Dartington Hall School and Dartington Tweed Mill were established, followed by Dartington Glass and The Shops at Dartington. Times change, and in 2015 Dartington Hall Trust held Open Space meetings following the arrival of CEO Rhodri Samuel to discuss proposals for the gardens, development, land use, food, arts, social justice and community of enterprises. One of the areas earmarked for expansion is food, with chef Oliver Rowe being appointed as Dartington Hall Trust’s Director of Food and Drink. It’s a good fit for the Dartington ethos – Oliver is the man whose trials in setting up a London restaurant with locally- sourced food was recorded in the BBC documentary, Urban Chef. Dartington is home to The White Hart Bar and Restaurant – holder of a Sustainable Restaurant Association star, The Roundhouse Café which offers drinks and light snacks, and a new space – The Green Table which has an informal atmosphere with big tables, a deli-style counter, an open- plan kitchen and a large terrace with tables and chairs. Oliver started cooking as a teenager, working in the kitchen of an art school in Tuscany, run by his cousin, the sculptor and art historian Nigel Konstam. He learned from Italian women how to make simple pasta dishes that owed a lot to the landscape surrounding him. At the age of 22, he wandered into the kitchens of Moro in London looking for work and found himself honing his craft there. Stints at restaurants in London and France followed before he opened a café in London and then a restaurant, Konstam (after his grandmother) at the Prince Albert – the focus of the Urban Chef series. “My mum was a very, very good cook, and so was my grandmother, and I definitely have a connection to that period in time. One of the great things about the chefs at Dartington is they’re not throwing anything away; there’s an appreciation for the ingredients – the way they’re cooked and presented. It’s about keeping it simple,” Oliver adds. 8 million pieces of plastic are making their way into the ocean every day, an estimated 8.3 billion straws are on coastlines around the world and 1.75 billion single-use plastic bags are still being handed out by supermarkets in the UK. With plastic never fully degrading this has already and will continue to have a huge impact on our planet. The 5p plastic bag levy (which will soon increase to 10p) has helped to reduce the number of bags being used and there are other nationwide schemes available, however much more still needs to be done. Many of the local businesses and organisations in and around Totnes have been making a conscious effort to reduce, reuse and recycle for many years now. Most recently the Plastic Free Totnes campaign has been developed, a community-driven movement aimed at reducing the use of single-use plastics across town. Formed from the Transition Town Totnes Waste Into Resources group in partnership with Totnes Rubbish Walks and Totnes Against Trash, they have signed up to the ‘Plastic Free Communities’ campaign led by Surfers Against Sewage which sets out 5 objectives for the town to meet including replacing single-use plastics with sustainable alternatives. Many businesses including Waterside Bistro have signed up to Refill Devon, a free tap water initiative designed to reduce plastic pollution by making refilling a water bottle easy, social and rewarding. Earth Food Love was the UK’s first zero-waste shop and is based at the top of the High Street in the area known locally as the Narrows. The shop was started by ex-Manchester United player Richard Eckersley and his wife Nicola after their frustrations with how much packaging they used as a family. With a simple self-weighing system, consumers can bring in their refillable pots and buy everything from flour to peanut butter, tea, fruit, syrup and many more food items, plus non-food items including washing up liquid, wooden toothbrushes, metal straws and bamboo cutlery. 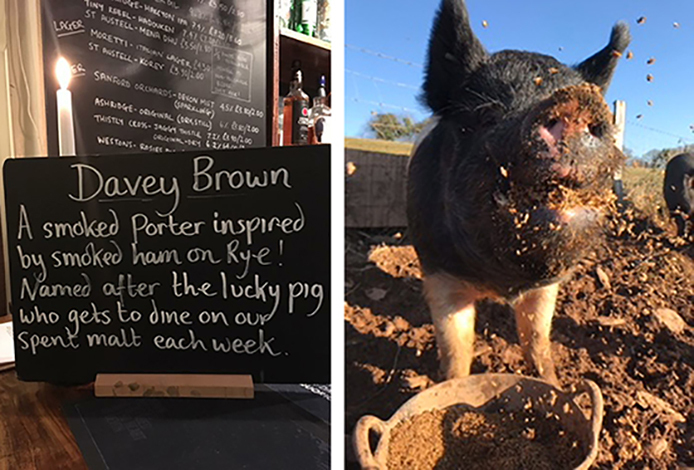 Other businesses who are striving to significantly reduce their waste and actively encourage recycling include the riverside restaurant Waterside Bistro who feed their coffee grounds and vegetable peels to the owners’ chickens, and the Totnes Brewing Company who feed excess malt and grain from their brewing process to local pigs. As a small, independent, family-run brewery, the Totnes Brewing Company is very close to zero waste and has a very low carbon footprint. With the main brewing area at the back of the bar, you can watch one of your future pints being made while sipping on your last, and the benefit of production taking place on site is that it significantly reduces carbon footprint. Many beer kegs are now made out of plastic as they’re lighter and easier to transport but of course, they’re not environmentally friendly, therefore owner Sarah Trigg reuses them as seats for the pub or gives them to the local community for free to be used as garden cloches. As a nation of dedicated coffee drinkers, Brits are throwing away 7 million disposable coffee cups every day. As they are very difficult to recycle due to the layer of a waterproof plastic inside, this is adding to an already massive problem. At The Hairy Barista, a speciality coffee shop on High Street, they actively encourage people to use reusable coffee cups and they themselves use compostable straws as well as supplying and using vegan, organic and plant-based ingredients, food and drink. 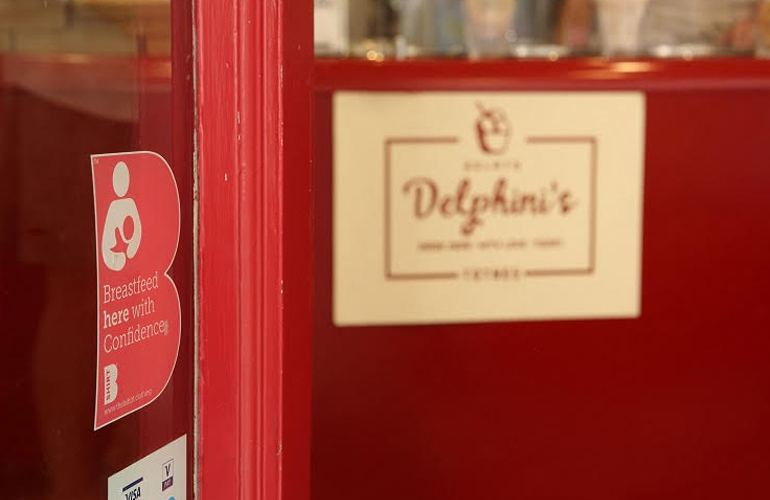 Delphini’s also use compostable cups, lids and spoons for take away gelatos, Waterside Bistro has banned plastic straws and The Kitchen Table, a bespoke catering company, use recycled or compostable kitchen supplies and take-away crockery and cutlery. How many High Streets in Great Britain can boast their very own independent art-house cinema? Totnes Cinema CIC is a social enterprise, set up by a local couple, passionate about film and excited about Totnes. So far the project has been entirely funded by local donations and memberships and the success of its carefully chosen programme, and we still have plenty more to do!! All the bar staff, stewards, and musicians volunteer their time and are paid with the chance to watch the film. Totnes Cinema is located in the heart of Totnes, down a hidden passageway just off the High St. Our mission was to bring back the magic of cinema to our local town. We were inspired by a wonderful photograph, taken in the late 1940s of boys holding banners saying “Save our Cinema,” and in true Totnes style, they marched up the High St to make their feelings known. There had been a cinema in Totnes from the early days of film and the last remaining one, The Romany, closed its doors in 1964 due to falling audiences. The building became the well-loved Totnes Library until its expansion and relocation, and the building fell empty. As a local couple, film lovers and with teenage children, we took on the challenge of re-creating a cinema for our local town center to create a social and cultural hub in the town. As you leave the hustle and bustle of the market day, you are taken into this unique and surprising space, more like a Berlin cabaret than a cinema, with subdued lighting, comfy sofas, bistro table and chairs and luxurious cinema seats on the balcony. We even have a baby grand piano! As a truly independent cinema, we can offer a wide range of films, carefully chosen from all genres including classic black and white film noir, the best from musical theatre, and modern-day classics and Oscar winners. With a fully licensed bar which stretches the width of the building, beneath an enormous screen we encourage people to come early and enjoy cocktails, fine wines, and craft beers and to meet up with friends, often with live music and a showreel of classic adverts. There is always someone around afterward, to chat and discuss the film. On a Saturday you can pop in for excellent coffee and homemade cake, as our “mystic portal” opens up to daylight. We believe we add to the uniqueness of our wonderfully independent High St and complement all the many individual traders and businesses around us, bringing life to the evenings on the High St as well as the days. The BE Wild! initiative follows a study of 1,000 parents by Beyond Escapes which found that over a third, 36 per cent, of UK mums and dads don’t think their children spend enough time playing outside. Whilst parents themselves nostalgically remember tree climbing (19 per cent), den-making (17 per cent), playing hide and seek (12 per cent) and even making mud pies (5 per cent of them!) as some of their favourite childhood activities, they don’t think their own kids get outdoors enough…and are looking for ways to get them off their smart phones and engage with the wild! Although many parents, 32 per cent, have built dens with their children during the past six- months, these are made from mainly sheets, curtains, chairs and towels; indoors, in the lounge! In fact, 52 per cent of all dens are now made at home in the bedroom, playroom or lounge, with only 23 per cent made in an outdoor space! So, now is the time to turn this around to bring back true the true den building experience! 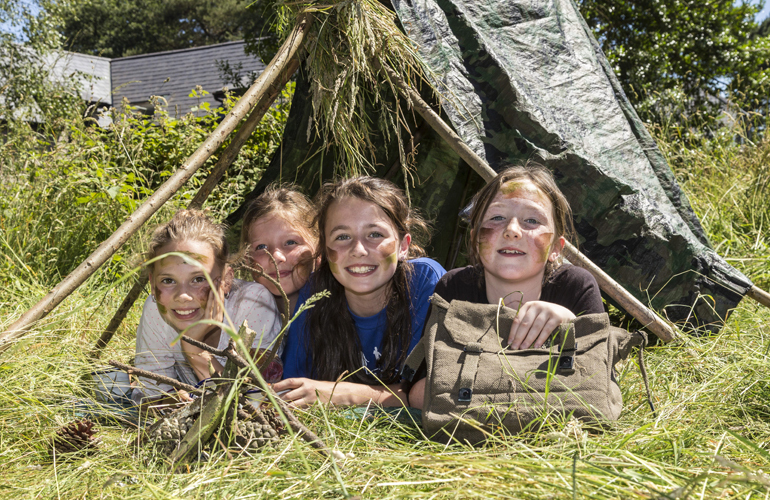 Mark Sears, from The Wild Network and Director of Dens at Beyond Escapes, commented: “Beyond Escapes approached us with this great idea to introduce complimentary den making kits to hire at their Devon resort, which we have helped advise on. Getting kids outside, detoxing from their smart-phones and tablets and ultimately rewilding them is what we are all about and we have seen more and more parents join us to encourage families and communities to do just that with positive results. For those keen to get den building in their own garden, or to practise their den building skills before visiting Beyond Escapes, Devon, follow these key steps produced by BE Wild! 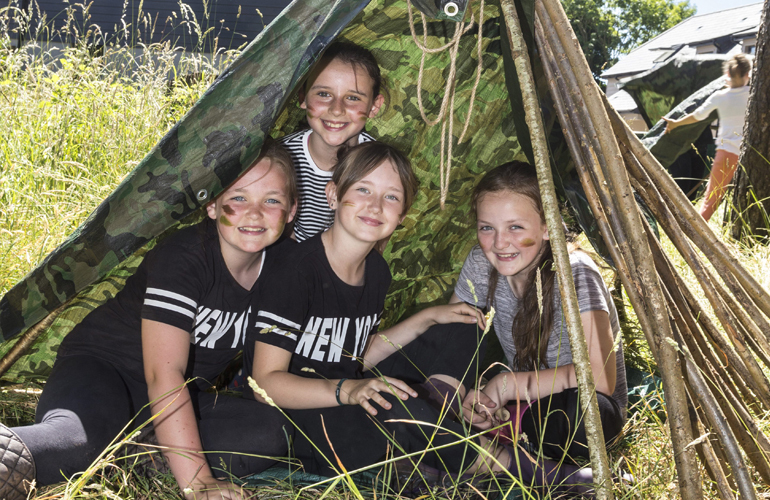 Jason Bruton, Managing Director at Beyond Escapes, said: “Our new den-making initiative was designed following a study which found that families were crying out for a reason to enjoy their nostalgic childhood activities, whilst simply getting outdoors. Helena Wiltshire, from Save the Children, added: “We’re thrilled that Beyond Escapes will be supporting Save the Children’s Den Day. The BE Wild! 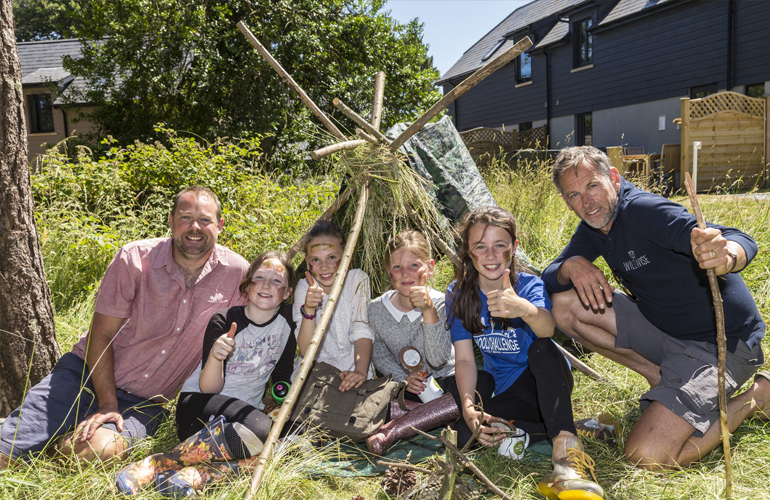 ‘re-wilding’ initiative is a fantastic way to encourage families to spend quality time together, get creative and build some dens this summer. We hope lots of families get involved and have some fun, whilst raising as much money as possible! Beyond Escapes, Devon, set in the glorious South Devon hills, offers luxury self-catering accommodation options ranging from one bedroom BE Chic Studios to BE Deluxe Mansion Suites and two, three and four bedroom BE Deluxe Lodges complete with their own private hot tubs, as well as dedicated pet and baby friendly lodges. Top-class facilities on-site include the BE You Spa and Gym, and BE Tempted Restaurant serving locally-sourced dishes as well as offering tempting takeaways and hearty breakfast packs delivered directly to your accommodation. The historic market town of Totnes in Devon is set to host the sixth Totnes Pride on Saturday 1st September 2018. 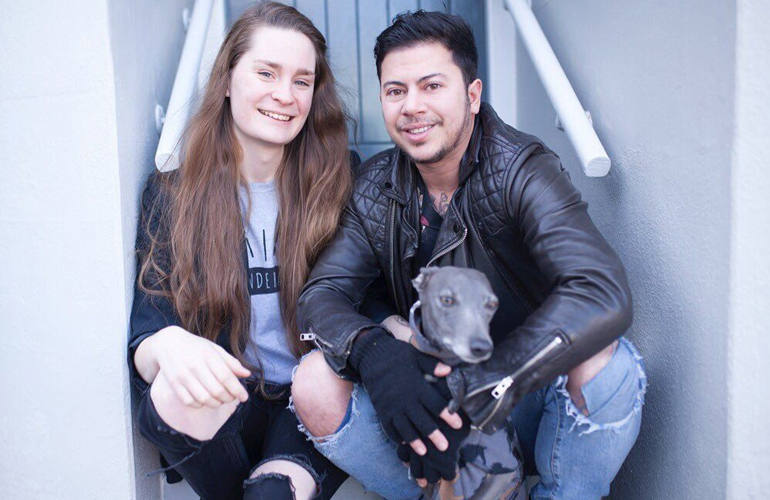 Social enterprise Proud2Be is laying on a whole host of events, which will bring the lesbian, gay, bisexual, trans, intersex and/or asexual+ (LGBTQIA+) community together with their allies, to celebrate diversity in the town. 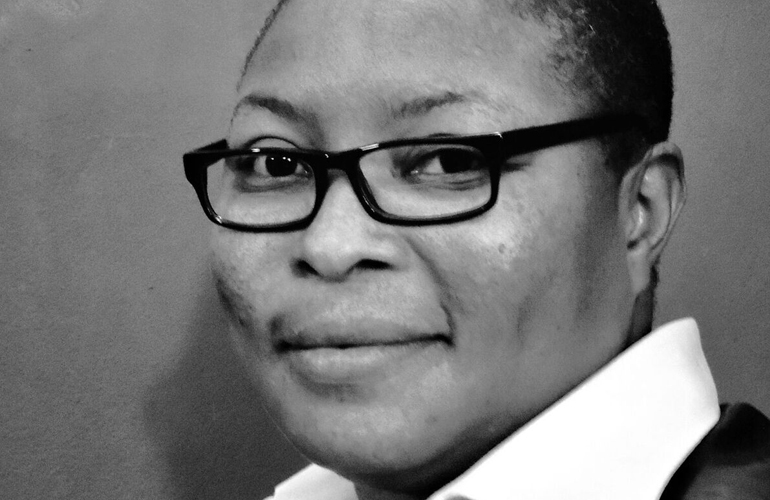 This year’s special guests are Human Rights Activist, Feminist and founder of African Rainbow Family Aderonke Apata and Film makers (My Genderation) and trans campaigners Fox and Owl. The day kicks off at 10.45am outside The Dartmouth Inn with a special performance from Spectrum Choir and opening speeches. The award-winning Samba ROC Band, will then lead a procession up Fore Street and High Street to Totnes Civic Hall at 11.30am. The road closure will be in place between 10.30am – 1pm at Ticklemore Street and from the bottom of Fore Street up to where the High Street meets Castle Street. Community bus service Bob the Bus will be running a park and ride service from 10am at King Edward VI Community College (KEVICC) and will also be transporting wheelchair users and those with mobility issues up the procession at 11.15. It is at the Civic Hall from midday, where visitors can enjoy workshops, talks and live music, community stalls, Dot’s Cafe, a youth space and a variety of family-friendly activities including art and craft, slime making, face painting and much more. There will be a panel discussion from 3:00pm at Pie Street, where local and national activists will discuss the theme: ‘Can We Be Proud of Pride?’. The fun continues into the evening at Totnes Pride After Party from 7.00pm at Totnes Civic Hall, which will be hosted by The Ambiguous A and feature live music from popular Disco Funk band Golddust and DJ sets from Mamma Boogie Oogie, Rhi Rhi Rhythm and Madame Souza. Due to a successful bid to People’s Health Trust using money raised by HealthContact through The Health Lottery, entry to all daytime events are free. Tickets to the After Party are £10.00 (16 and over) and are available to purchase online and at Totnes Pride day event. To mark the event Totnes Town Council will once again, raise the rainbow flag over Totnes Civic Hall. The flag raising ceremony will take place on Monday 27th August at 6.30pm, followed by a Totnes LGBTQIA+ History Tour led by local Writer, Historian and Publisher Bob Mann. Inspired by their own experiences of bullying, discrimination and shame- identical twins Jae & Max Price set up Proud2Be in 2011 when they recorded the first Proud2Be video. Since then various public figures and members of the public have contributed to the campaign. As well as campaigning and hosting Totnes Pride, Proud2Be facilitates various groups and events, including a social group, activity days, fundraiser discos and more. In 2014 Proud2Be launched its youth project which now includes a youth group and a counselling & mentoring service. Proud2Be delivers workshops to school students and awareness training to organisations around the UK. Proud2Be are looking for volunteers to help out on the day. If you would like to get involved, please email Jules & Dot at volunteer@proud2be.co.uk. Proud2Be are also encouraging local businesses and residents to show their support by displaying rainbow flags during the week of Pride. These are available to buy for £7 from Proud2Be. To find out more about Totnes Pride or to buy an After-Party ticket, please visit totnespride.co.uk or email info@proud2be.co.uk. 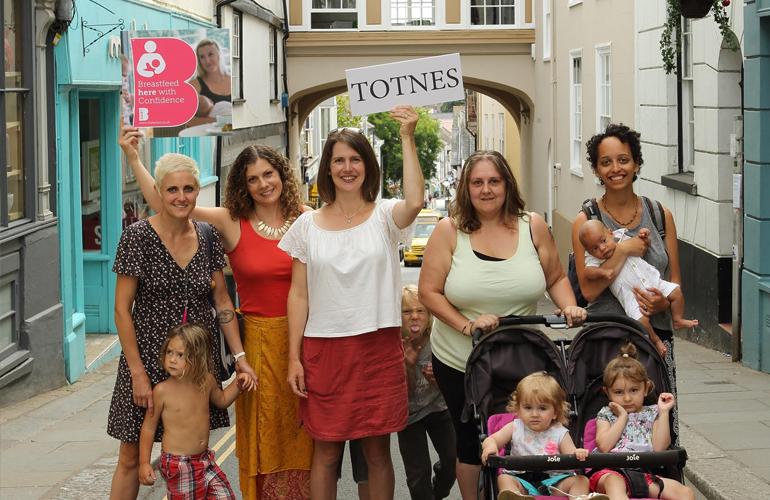 As World Breastfeeding Week begins on Wednesday 1st August, two mumpreneurs from Devon are delighted to announce that they are on their way to making Totnes the UK’s most breastfeeding friendly town. On a mission to improve breastfeeding rates in the UK, which has according to UNICEF some of the lowest in the world, working mums Lisa Lessware and Philippa Doyle launched their ‘Breastfeed Here with Confidence’ scheme in March. Widely known for its unique vibe and independent spirit, nearly every cafe and eatery on Totnes high street is now displaying the latest breastfeeding friendly badge. 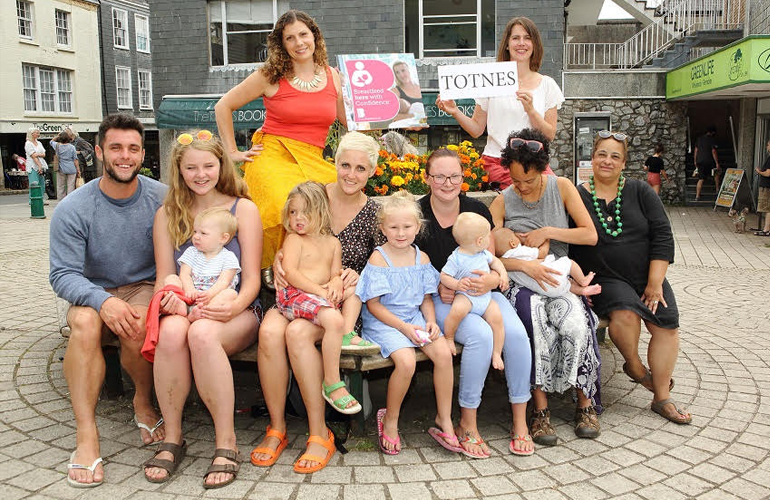 Over 40 cafes, eateries and businesses have signed up to the ‘Breastfeed Here with Confidence’ scheme in Totnes alone, all highlighting their support of breastfeeding mums. 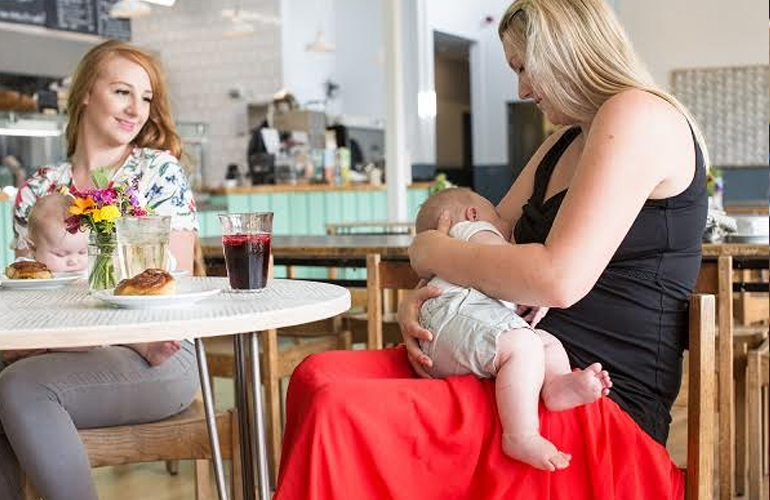 Both the NHS and UNICEF list embarrassment at feeding in public as a major barrier to breastfeeding and Lisa and Philippa wanted to do more to minimise this, helping mums be safe in the knowledge that they can do so with confidence. The family friendly destination store, Dobbies Garden Centres, became the first official national retailer to sign up to the Bshirt ‘Breastfeed Here with Confidence’ scheme during National Breastfeeding Week in June, with the badge becoming a permanent fixture in all 34 centres throughout the UK. Signups in Totnes range from cafes, restaurants, business and shops, including – Rumour, The Curator Cafe, Waterside Bistro, Hairy Barista, Maisie’s Cafe, Hill House, Mange Tout, Saveurs, South Hams Citizens Advice Bureau, The Old Bakery, Pie Street, Room 101, Seeds Bakery, The Cornish Pasty Co, Delphini’s, Zero Waste, Woods Bistro, Rare Breeds Farm and Willow to name just a few. In and around the South Hams, the response has been equally positive with the likes of Riverford Field Kitchen and The Venus Company displaying the badge. With the world spotlight on breastfeeding, the news follows the US announcement that it is now legal to breastfeed in public everywhere in the United States, following the passing of laws to legalise public breastfeeding in Idaho and Utah. Lisa and Philippa are looking forward to welcoming even more businesses to the scheme in the South Hams and beyond to help women in the UK breastfeed with confidence. To read more about the Bshirt’s ‘Breastfeed Here with Confidence’ scheme, register interest or nominate a venue to display the badge, visit breastfeedwithconfidence.org.uk. There are many ways to enjoy eating al fresco in and around Totnes with delicious menus at riverside restaurants, pretty pub gardens and high street tables, but why not take your open air eating to another level and have a picnic in a unique location with far reaching views of the countryside. With July being National Picnic Month what better time to do so. When it comes to deciding where to kick off your shoes and lay your blanket we have many beautiful locations for you to try. Why not explore the River Dart and neighbouring coast from a whole new perspective with Canoe Adventures and Sea Kayak Devon and choose a secluded spot along the way to stop for lunch. Or with the Dart running through Totnes you can sit along the bank of the river and watch the boats go by while enjoying your plate of nibbles. There are also many natural and leafy parks and gardens in and around town and on Dartington Estate where you can stop and relax, enjoy your food at leisure and watch the children play. You could combine your picnic with a short walk or cycle from Totnes to Sharpham Cheese and Wine, Dartington Estate or the Shops at Dartington where you can stock up on more local food and drink, have a wander and soak up the superb views of each location. Take a steam train to Buckfastleigh with South Devon Railway where you can walk (or take a bus) to Buckfast Abbey and enjoy your food in the stunning grounds, or walk along the river while listening to the birds sing. Climb to the top of Totnes Castle and gaze at the wonderful views of Totnes and beyond or visit Berry Pomeroy Castle, both offering the perfect location to enjoy your refreshments. 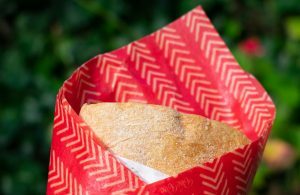 When it comes to deciding what to pack for your picnic the wide variety of delis, cafes, independent shops, farmer’s markets and bakeries in Totnes, Dartington and Sharpham mean you can ditch the soggy sandwiches and create a fresh, local and seasonal feast fit for all. If you fancy some Devon Blue or Sharpham Rustic cheese to go with your crusty bread, visit Sharpham Wine and Cheese or Country Cheeses and Saveurs, The Old Bakery or Flour & Rice for the loaf. For some fresh fruit and the all important salad grown locally in Devonshire soil try Annie’s or The Happy Apple, or if you’re feeling more Mediterranean why not grab some olives, charcuterie or continental cheeses from Mangetout, Jano or Amalie’s Deli. And no picnic is complete without a slice of homemade cake so stop off at Waterside Bistro or one of the many cafes or bakeries in and around town for some tasty treats. Most cafes and independent food outlets in town will also supply take away drinks from the likes of Luscombe to keep you hydrated on those balmy summer days…or why not sample a bottle of something fizzy or fruity from the Totnes Wine Company, the only shop in town to stock the entire range of Sharpham wine. For those who’d like all the pleasure of eating in nature but don’t have time to prepare the food, The Kitchen Table specialises in outside catering and sources all of their key ingredients from within 30 miles of Totnes, so you will get quality, local food without any of the hassle. Don’t forget to pack your sun cream or raincoat for those unpredictable days but most of all, stop, relax and enjoy your day being at one with the world. Did you know it’s National Camping Month? With the hustle and bustle of life and many of us relying so heavily on our phones and other electrical devices, what better way to switch off and relax than to take to the great outdoors and go camping or glamping. Put the phone down and listen to the birds sing, take away the ipads and build a den with the kids, and get away from the TV to gaze at the stars. With June being National Camping Month there’s no better time to try it – whether a first-timer or camping aficionado, there are many places in and around Totnes where you can escape to the country and get back to nature. Higher Broadgates Campsite is based in the beautiful village of Cornworthy, just 20 minutes from Totnes, where you can secure a pitch on their flat, working farmland for only £10 for 2 people. If you’d like all the joys of sleeping al fresco but you’re not ready to bunk in a sleeping bag, they also have 2 Bell Tents which offer many homely comforts including beds, fairy lights, BBQ, hamper and games costing £55 a night. The family run farm has a toilet and shower for visitors to use and is dog-friendly as well, offering the perfect excuse for a long, country walk. Just 3 miles from Totnes in the village of Littlehempston, Devon Yurts offers an excellent base for a short break or longer holidjay with their comfortably furnished traditional Mongolian yurts and beautifully rustic Shepherd’s Hut. Visitors will be able to cook a hot meal on site in the communal kitchen, toast marshmallows on a campfire or dine in one of the traditional, local pubs, while enjoying on site comforts including fully flushing toilets, hot showers and solar power. Prices start from £50 per night for 2 people in low season. If you’re camping on a budget and have all of your own equipment, Beara Farm is the perfect place to pitch up a tent or park your campervan. This 3.5 acre level meadow is only a 15 minute drive from Totnes just outside of Buckfastleigh, or if you’d prefer a more leisurely journey you can take an historic steam train from South Devon Railway which is a 30 minute walk or 5 minute drive from the campsite. At Camp Dartington just outside of Totnes you can wake up to views of Dartmoor, wander through 1,200 acres of stunning woodland and listed gardens, and enjoy many delicious treats at one of the onsite cafes and Shops at Dartington. The site also boasts a traditional 14th Century Barn Cinema and goat’s milk ice cream made fresh at Dartington Dairy! Other local sites include Steamer Quay Caravan in Totnes itself, Broadleigh Farm Caravan Park and Higher Well Farm & Holiday Park both near Stoke Gabriel. So consider swapping bricks for canvas this summer, breathe in the fresh Devonshire air and stomp your stresses away in the countryside. Totnes and surrounding area in the Spotlight . . .
Totnes, and the surrounding South Devon area, has often had a starring role in films and television series. Churches, historic houses, ferries, even harpoon guns, carnivorous crabs and suicidal fish, they’ve all played their part. Down the River Dart from Totnes is “Lighthaven”, as featured in the television series The Coroner, a town better known as Dartmouth to locals of course. The hit daytime show stars Claire Goose as single mum Jane Kennedy who returns to her hometown to investigate murders alongside childhood sweetheart Detective Sergeant Davey Higgins. Amoungst other sites used in the filming of The Coroner are Blackpool Sands, Leonards Cove, Slapton Sands, Bellever Forest, Bonehill Rocks, Hound Tor and Salcome. And not forgetting the Dartington Estate of course as this features regularly throughout the series, and is where The Coroner’s production office was based. Dartmouth is not of course new to being featured on television as it was also used for the Onedin Line, a 1970s BBC shipping drama set in Liverpool. Bayards Fort, the scene of many TV series, was used in the series and is at the far end of Bayards Cove from whence to Pilgrim Fathers sailed a long, long time ago. Further along the coast at both Bigbury on Sea and Burgh Island Agatha Christie’s two famous sleuths and acclaimed crime-solvers Poirot and Miss Marple have been filmed, starring David Suchet and Geraldine McEwan respectively. The beach at Bigbury on Sea has also been seen in television shows such as the 1980s’ classic Lovejoy and GMTV’s slimming segment Inch Loss Island (starring Anton du Beke). As well as the setting for various adaptations of Christie’s Evil Under The Sun, the location also featured in the 1965 film Catch Us If You Can, starring the British band The Dave Clark Five. Further along the coast is the port and seaside town of Teignmouth, used for The Mercy, the Donald Crowhurst Movie. Filmed in Teignmouth in June 2015 and starring Colin Firth and Rachel Weisz the film tells the story of the doomed yachtsman Donald Crowhurst. The film was released in February 2018. Moving inland as far as the parish of Marldon, in the small village of Compton, Compton Castle was used as the estate of one of the characters in the film Sense and Sensibility. Sense and Sensibility was a hit screenplay directed by Ang Lee and based on the Jane Austen novel. With an all-star cast, featuring Alan Rickman, Emma Thompson, Kate Winslet and Hugh Grant it managed to be nominated for seven Academy Awards with Emma Thompson scooping the Award for Best Adapted Screenplay, having written the script as well as staring in the film herself. St Mary’s Church in Berry Pomeroy also makes an appearance in the final wedding scene of the film and is situated not far from Totnes. Built in the 1490’s this historical building is still a large part of the community at Berry Pomeroy. Nearby is Berry Pomeroy Castle, rumoured to be one of the most haunted places in England, making the Castle and St Mary’s Church a great day out for film lovers and history buffs. Moving even further inland and thanks to the release of the popular film War Horse, co-produced and directed by Steven Spielberg, Dartmoor National Park is now a must see destination when coming for a holiday in South Devon. The box-office hit, released in the UK on 13th January 2012, focuses on the captivating story of a farm boy from Devon, Albert Narracott (played by Jeremy Irvine) who grows attached to his young horse, Joey. After a heavy downpour which destroys the family’s turnip crops, his father, is forced to sell the horse to the army so that he can pay his rent. The blockbuster takes the audience through a moving journey about how Albert joins the army in search for his horse Joey after he is shipped to France during the First World War. Benedict Cumberbatch and Tom Hiddleston have roles in the movie. Many of the locations used in War Horse are in rural areas on Dartmoor but are still within a short driving distance of Totnes. Bayards Kitchen is offering all those who work in emergency services 10 per cent off food and non-alcoholic beverages at its Dartington café to coincide with the launch of its new weekly pizza evenings. The café, which was taken over by Charlie and Zuzana Deuchar in November 2016, is a thriving hub for the local community and beyond, with safe play areas for toddlers indoors, and eclectic menus that includes vegan, vegetarian and gluten-free options. Now Charlie and Zuzana want to give back to the local emergency services by giving them a permanent discount off all food and non-alcoholic drink orders. Charlie said: “People who work in the emergency services spend their working lives looking out for others and saving lives. Those eligible for the discount include NHS workers, armed service personnel and those who hold a Blue Light Card, which provides a multitude of discounts for armed service personnel. The discount will be launched on May 18, at Bayards Kitchen’s inaugural pizza evening. “We’re really proud to be supporting the emergency services in this way, and we thought the perfect time to launch would be at the first of our Friday night pizza nights when everyone who comes along will be given a free glass of prosecco. Everyone loves pizza and we’ll be offering eat in and take out service,” said Charlie. With the Totnes to Sharpham walk so picturesque, we just had to make a visual guide to show you the natural beauty of one of South Devons glorious walks. This moderately easy walk along along the Dart Valley trail takes you to Sharpham Vineyard, where you can sample locally-produced wine and cheese! The bustling ancient market town of Totnes is situated at head of the estuary of the River Dart, and is the starting point to The Dart Valley Trail. Read more. British retailer and social enterprise, The Shops at Dartington, are to introduce a brand-new permanent distillery within their Food Hall, to launch at the start of May. In partnership with Devon Distillery, the new copper still will produce The Shops at Dartington’s signature bottle of Elmhirst Gin, and will also have the capability of producing other contract gins as well as other spirits at a later date. The distillery will also be running a boutique gin experience, enabling small classes to learn the process of making gin, while they can smell, taste and witness the entire process from start to finish. Cosmo Caddy, the founder of Devon Distillery, has alcohol production in his DNA, as his grandfather founded Sharpham Vineyard in the year Cosmo was born. Cosmo travelled the world in pursuit of wine and spirit production, before honing his craft in Italy with a 9th generation grappa distilling family. He then returned to South Devon and crafted Dappa – Devon’s version of grappa made from the skins of Sharpham Wine grapes, as well as launching the UK’s only mobile still known as ‘Still on the Move’ that makes bespoke gin anywhere in the country. With more than grape vines running through his veins, Cosmo’s roots also lead back to Dartington, as his great-grandparents, Leonard and Dorothy Elmhirst were the pioneering entrepreneurs who founded the Dartington Hall project. When the Elmhirsts purchased the then neglected 14th century Dartington estate, they restored the estate buildings and set up a host of farming, forestry and educational products including Dartington Hall School, Dartington Tweed Mill and Dartington Glass. As innovative thinkers themselves, Dartington became a magnet for artists, architects, writers, philosophers and musicians from around the world. 93 years later, the Elmhirst’s direct descendant, Cosmo Caddy intends to build on his predecessors’ legacy and will continue to instil the values of his ancestors in Devon Distillery at The Shops at Dartington. Bringing the still into the Food Shop creates high visibility for this interesting process and visitors will be able to witness the process of distilling. The Shops at Dartington are situated on the grounds of the picturesque Dartington Estate and consists of 15 unique, independent shops in South Devon, near Totnes. The shops are based inside quirky buildings as this part of the estate was an old cider press. It’s a family destination, with parks and activities for young children. Situated at the head of the Dart Estuary and surrounded by beautiful countryside, renowned for its history, retail, eateries and alternative lifestyle, Totnes has become a destination town, for many reasons, for visitors and locals alike. But, did you know that Totnes is also a Fairtrade Town and has been so since 2011? The town is home to a range of small independent retailers selling ethical products, whole foods and, most importantly, fair trade goods. Totnes even has two award winning shops for fair trade. One for Fairtrade food and one for fair trade gifts and homewares. Each year businesses and organisations are invited to enter the Business Awards by Fairtrade South West. These awards are open to everyone from national chains to sole traders, universities to hotels, food retailers and cafés. More information on this can be found at www.bristolfairtrade.org.uk/south-west-fairtrade-business-award. At this point you may have noticed that the phrases Fair-trade and fair trade have been used. To clarify, Fairtrade is a global movement with a strong and active presence in the UK, represented by the Fairtrade Foundation, and works with producers of foods, tea, coffee and cotton. Fair trade is when craft and artisan producers of gift and homewares in developing countries are paid a fair price for their work by people and businesses in developed countries. These businesses are certificated as a fair trade supplier by the British Association of Fair Trade Suppliers (BAFTS) and/or the World Fair Trade Organisation (WFTO). • Trading practices are fair and not one-sided. • Prices paid are fair and sufficient for producers and workers to earn more than enough to meet their day-to-day needs. • Payments are often made in advance to ensure the supplier can fulfil orders. • The payment of premiums for producers and workers to use for infrastructure projects. • Producers and workers have a voice, whether organised into groups or involved in workplaces where there is freedom of association. • Safe working conditions, non-discrimination and welfare of children. The start of Totnes’ journey to become a recognised Fairtrade Town began September 2006 when a small steering group was established and they began with asking Totnes Town Council to use Fairtrade tea and coffee and to ascertain which shops sold Fairtrade products. In less than a month it was established that 5 independent businesses and two high street brands in Totnes were selling Fairtrade products. This number was to grow. Currently, there are 32 independent retailers in Totnes selling fair trade foods and homewares. Between 2007 and 2010 the Totnes Fairtrade Group began to investigate how the town was to become a recognised Fairtrade town- and consider how to meet the 5 goals as set by The Fairtrade Foundation:- 1.Local council to pass a resolution supporting Fairtrade and agrees to serve Fairtrade products. 2.A range of Fairtrade products are readily available in the area’s retail outlets and served in local cafes, restaurants and pubs. 3.Local workplaces and community organisations support Fairtrade and use Fairtrade products wherever possible. 4.Media coverage and events raise awareness and understanding of Fairtrade across the community. 5.A local Fairtrade steering group is convened to ensure the Fairtrade Town campaign continues to develop and gain new support. By July 2010, following a lot of hard work by the volunteer group, an application was made to the Fairtrade Foundation. And in April 2011 Totnes was granted Fairtrade Status. Every two years since the group have to reapply, showing planned actions, that objectives set 2 years previous had been achieved and then set a programme for the coming 2 years. In February 2007 the Totnes Fairtrade group promoted their first Fairtrade Fortnight, which is organised nationally by the Fairtrade Foundation and locally by volunteer groups. They approached schools, offering to take assemblies and explain what Fairtrade is. The local churches and church groups were approached and asked if they would consider using Fairtrade tea and coffee for their meetings, they were very supportive of the idea and soon all were using Fairtrade teas and coffees for their meetings and social functions. This celebration of Fairtrade runs from the final Monday in February for two weeks; and every year since 2007 the group go out to the schools and the businesses in Totnes, to increase awareness of Fairtrade products, whether that that be food, clothes, homewares or gifts. Over the years a number of growers from developing nations have been invited to Totnes to give talks on how Fairtrade has affected them. These visits are arranged by Devon Fairtrade and each local group. The Totnes Fairtrade group raise funds during the year to contribute to the speakers travel and visa costs (along with other South West Fairtrade Groups who will also hold an event). This year Victor Biwot, Operations Manager from Sereet Tea Corporation in the Nandi Hills, Kenya. He will give a power point presentation to local primary and secondary school pupils at a conference being facilitated by King Edward VI Community College, Totnes, so they can see where he lives, the tea plantation and factory in which he works and how Fairtrade has benefited his life. During this year’s Fairtrade Fortnight – 26th February to 11th March 2018 – many food and retail outlets across Totnes will have counter displays and leaflets explaining all about Fairtrade. This year’s theme is “Come on in” and meet the farmers and workers who grow our food, whose lives have been improved thanks to Fairtrade. The Totnes Fairtrade Group have used many novel ways to raise the awareness of Fairtrade and to raise funds. From being dressed as bananas for the local carnival to selling fruit smoothies, using Fairtrade fruit donated by local businesses, during a recent market event. This type of fundraising, along with coffee mornings, is now to have signs erected on the approaches to Totnes declaring that Totnes is a Fairtrade Town. Fairtrade changes the way trade works through better prices, decent working conditions and a fairer deal for farmers and workers in developing countries. It’s when the price we pay for products gives enough to producers for them to afford life’s essentials – like food, education and healthcare. So Totnes is a great place to live, visit, eat and shop. It is an ethical town, it is a Fairtrade Town – and proud of it. There are so many ways to say ‘I love you’ to the important lady in your life. Whether you’d like some quiet time relaxing with just you and your mum or a more raucous affair with the whole family, there’s something and somewhere to suit all lifestyles and budgets in and around Totnes. Renowned for having many cafes and restaurants offering delicious, local and ethically sourced food and drink, you’ll find everything from a three course lunch to coffee & cake both in and out of town, with TQ9 at The Royal Seven Stars, the Waterside Bistro and The White Hart at Dartington to name just a few. If you decide to treat your mum to a home cooked meal this year, why not pick up some fresh ingredients from one of the local delis or farm shops and prepare a tasty breakfast, lunch or dinner fit for a Queen. However much you want to spend, both Totnes High Street and the Shops at Dartington are full to brimming with perfect ways to show your lovely mums just how much they mean to you with some of the most unique gifts from a wide range of independent shops and retailers. From scented candles to wine, handmade fudge to pretty porcelain mugs, there’s something for all tastes and to suit all budgets. Visit Me and East, Firefly or Pagoda Interiors for something handmade and ethical, Timehouse for something retro, White Space or the Bowie Gallery for something arty, Colony for something funky or China Blue, Out of the Blue or the new Moon Stone Hare for something simply beautiful. If you’re looking for a fun day out for all the family why not visit Pennywell and mums will be treated to a complimentary cream tea, take a ride on the steam train at South Devon Railway or paint an ornament at China Blue. Or if you just want to spend some quality time together without any fuss then why not go for a walk along the River Dart, sit and relax on one of the benches and simply take the time to catch up with each other. Take a trip to the beautiful St. Mary’s Church to admire the architecture or visit one of the wonderful surrounding villages from Dittisham to Broadhempston or anywhere in between. Why not go ‘crabbing’ in Stoke Gabriel or walk around the stunning gardens on the Dartington Estate. Whatever you choose to do or however you show your appreciation you’ll be sure to find something truly magical here in Totnes. Tucked away down a siding of one of Devon’s beloved steam railways is a conservation project helping to reintroduce endangered species to the wild. The Dartmoor Otters and Buckfast Butterflies Sanctuary at Buckfastleigh is a small visitor attraction where you can learn about these beautiful creatures and the important work happening to protect them. We were invited to review the sanctuary by Visit Totnes. This was our first mini-adventure of the summer holidays and the girls and I had roped in Tin Box Grandma and Grandpa for the experience. None of us had been to the sanctuary before despite riding the South Devon Railway between Buckfastleigh and Totnes on other occasions. Tickets are available to combine the train, otter sanctuary and Totnes Rare Breeds Farm at the other end of the track. Together they make a full family day out in South Devon. Read more . . . It had been a day of dappled light and dragonflies. A day of strolling beside sun drenched vineyards, lazy meandering rivers and fragrant herb gardens alive with butterflies. As Hubbie and I sipped chilled glasses of sparkling wine and tucked into tranches of local cheese, we could be forgiven for thinking we were in the south of France, rather than southern England. We’d been exploring Devon, a county famous for it’s mysterious moors, sandy beaches, and national parks, yet it was a medieval market town that had our full attention today. It turns out there are plenty of fun things to do in Totnes, without a moor, beach or park in sight! Totnes has a colourful and legendary history, packed full of mythical kings, lords and rebels, and merchants and soldiers. Today it’s known more for its cultural scene, independent local shops and a rather unique cosmopolitan countryside vibe. The town sits on the picturesque River Dart, the sort of tranquil pastoral scene where you’d expect to encounter characters from Wind in the Willows. There are lots of things to do in Totnes, from castles and museums to steam trains and boat trips, but we had our eye on something a little different. Saxon in origin, Totnes has been known for both craft and industry, and was once an important and prosperous centre for trade. Although it is still a thriving market town, the Totnes of today is more popular with the artistic community and attracts visitors from near and far to enjoy the buzzing cultural scene and picturesque countryside. The focal point is Totnes castle, commanding a dominant position overlooking the town, and the intriguing range of independent shops, cafes and galleries are all within easy walking distance. There is also plenty to do in the surrounding area, so we spent a fun filled day checking out the best things to do in and around Totnes. Read more…. As well as being a key feature of the town’s picturesque landscape the River Dart has been an important part of trade in Totnes for hundreds of years. Today Totnes is a tourist hotspot but up until the late 20th century it was an important trading post on a busy river. Totnes owes much of its Elizabethan charm to the River Dart, the trade it enabled making many merchants rich and allowing them to build luxurious houses that still stand to this day. In the 16th century Wool and tin were the main exports, and helped Totnes to become the second wealthiest community in the country. As Totnes failed to respond to new trends in cloth manufacturing, and tin production in Ashburton declined, the boom failed to last and trade on the river diminished. However, as of 1636 it was still rated the country’s fifth wealthiest community. As debris from the last of the tin mines made it difficult to navigate the river, traders started to go to Dartmouth instead. It may not have recaptured the town’s Elizabethan heyday but the area of Totnes now known as The Plains was once a thriving district of factories exporting the goods they produced via The Dart. Notable businesses included cider makers Bentall, Lloyd and Co, and Symons and Co. Today upmarket residences can now be found where the factories once stood. Although the coming of the railway reduced the demand for traders on the river the Dart remains an important part of the town’s economy as a tourist attraction. Anyone visiting Totnes can make the most of the beautiful river, whether it’s by hiring a canoe, walking along its banks, or taking a cruise down to Dartmouth. In addition to inspiring a few modern musicians Totnes has had its fair share of historic success stories. Whether it’s the early exploration of Australia, or a connection to the inventor of the computer, the town has been home to important pioneers in their field. Below are four famous local heroes who have either lived in or were born in Totnes. 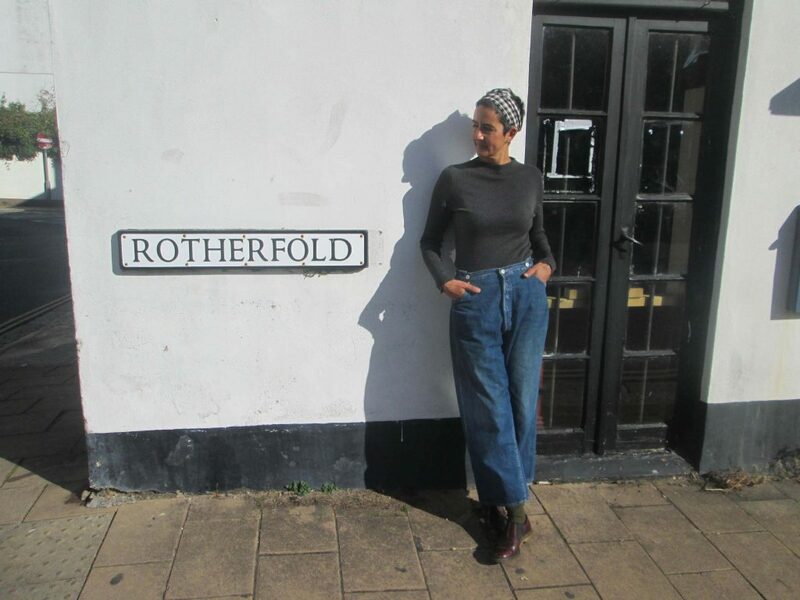 Visitors to the town may notice the Monolith that stands at the bottom of Fore Street. This is a monument to the explorer William John Wills, born in Totnes, the son of a local doctor. In 1861 he was part of an expedition that became the first to reach the Gulf of Carpentaria and cross Australia from North to South. Although she wasn’t born in Totnes the famous novelist Mary Wesley did call it her home, and while living in Totnes wrote ten bestsellers. During her lifetime she sold over three million copies of her books in total. Although it’s debatable whether Babbage was born in Totnes the farther of modern computing is definitely linked to the town. Not only was his Grandfather Benjamin Babbage the mayor of Totnes in 1754 but Babbage attended the King Edward VI Grammar school as well. Last but not least Dorothy Elmhirst will be remembered for co-founding the Dartington Hall project with her husband Leonard. After buying the hall in 1925 the Elmhirsts set about restoring the place and turned it into a project that promoted progressive education and rural reconstruction. As Totnes continues to be an inspiring place for artists, musicians, and innovators who knows what the future might hold for those born or living in the town today. Visitors can find out more about these local heroes by visiting Totnes museum, taking a stroll out to Dartington Hall or just walking around town. Flowing from two sources on Dartmoor, down to the sea at Dartmouth, Totnes is an important stop along the River Dart situated between the moors and the river’s mouth. The town offers an excellent jumping off point for exploration of the river whether by foot, boat or canoe, and is the point where it becomes tidal. Even for those who just want to admire the river without getting their feet wet there are many ways to enjoy the Dart, and many things Totnes has to thank the river for – and the two bridges crossing it. Totnes Bridge has the honour of being the last bridge to cross the Dart before it reaches open sea, as plans to build a railway bridge across the river mouth from Kingswear to Dartmouth in the late 1900s never came to fruition. There have been multiple bridges across the river in Totnes beginning with a river ford and evolving to the familiar stone bridge today. It was once a toll bridge that separated Bridgetown from Totnes until it was opened up on October 31st 1881 for everyone to cross. A second bridge was built in 1982 and although less picturesque than the older bridge was necessary for the increasing amounts of traffic passing through Totnes and across the Dart. It is named the Brutus Bridge after the legendary founder of the town. Whichever side of the bridge you’re on there are many places to enjoy the river from. Vire Island is worth a visit for anyone looking for a nice spot to enjoy a picnic. Although not a proper island the 400m peninsula is named after the French town Totnes is twinned with (not Narnia) and is the perfect spot for contemplating the river from in the summer. And there are plenty of restaurants and cafes to eat or enjoy a drink in, high tide or low, rain or shine. “Here I stand and here I rest, and this good town shall be called Totnes”. These are the words with which Totnes is said to have been founded by Brutus the Trojan while standing on Fore Street’s easily missed granite attraction – The Brutus Stone. According to the legend of the Brutus Stone the origins of Totnes stretch all the way back to ancient Troy. After accidentally killing his father Brutus set off to Greece with his army of followers, where he defeated the king Pendrasu. The king gave Brutus his daughter to marry, and 324 well-stocked ships, at least one of which ended up on the River Dart. Following the advice of the oracle Diana, who suggested the Trojans should travel to an island in the Western Seas that was possessed by Giants, Brutus set sail for Great Britain – at the time called Albion. It was on the Brutus stone that he made his proclamation after landing on Britain’s shores, undeterred by the giants and attracted to Totnes by its location and fish-filled rivers. Not only was Totnes named by Brutus, but it’s said he named Britain after himself. The Brutus legend is recorded in several ancient books, though there’s little evidence to suggest any of it is true. The stone itself probably settled in its location during the great Ice Age, and may have been called several things which sounded similar to ‘Brutus’. More recently, when Fore Street was widened in 1810, the stone was reduced in height from 18 inches above ground to the level of the pavement. Whether or not Brutus stood on the stone it’s a town custom that royal proclamations should be read there by the mayor. No matter how true they are, the legends surrounding Brutus and the stone persist and are enjoyed to this day. Visitors to Totnes can see the stone in the pavement on their right-hand side when walking up Fore Street next to number 51. The street performers of Totnes are as much a part of the town’s character as its castle, shops, and quay, and while musical tastes may differ there’s no denying that a few Totnesian troubadors have gone on to greater things. Below are two popular musicians you may have heard of but may not have known hail from Totnes, and one to watch out for. Electronic music group Metronomy was formed by Joseph Mount in Totnes in 1999. In addition to being the lead singer, and playing keyboard and guitar, Joe releases remixes of songs by the likes of Gorillaz and Lady Gaga under the Metronomy name. In 2016 Metronomy released their latest album Summer 08 though it was 2014’s Love Letters that delivered their highest chart position at number 7. If the name of Metronomy’s first album Pip Paine (Pay the £5000 You Owe) seems familiar it was inspired by the message painted onto old cars parked around town. Although not born in Totnes, Ben’s musical career did start here – one of his first musical gigs was in the Seven Stars Hotel. Since then Ben has released two critically acclaimed albums, Every Kingdom and I Forgot Where We Were. In addition to his musical achievements which include two BRIT awards and a number one album, Ben also has the honour of appearing on the Totnes £10 note. Ben’s clearly never forgotten his roots and the video for 2011’s ‘Keep Your Head Up’ was filmed at Dartington. Busy working on his second album and one to watch out for Ryan Keen was a guitarist and songwriter for other musicians before starting his own career in 2009. You can find Ryan on Twitter or listen to his latest song ‘Guidance’ here. With a thriving local music scene in Totnes and the South Hams the next big thing could be attending an open mic night near you, or even busking on the streets. So keep your eyes out and your ears open when you’re walking down the high street. Totnes has always attracted forward-thinking businesses with social responsibility at the core. Earth.Food.Love is the UK’s only, family-run, organic, bulk-buy, zero waste shop! Focusing on creating a better future, they decided to look back to the past, where eating real food with minimal packaging was normal practice. They believe returning to these simple ways will benefit not only our own health, but the planets too. The shop stocks a wide range of products such as grains, cereals, beans, legumes, flours, sugars, herbs, spices, loose leaf teas, nut butters, syrups, oils, vinegars, cleaning products and personal care products. Everything is self served and priced by weight, eliminating the toxic and wasteful packaging. Just take along any bottle, jar, tub or container; if it can be weighed, it can be used. Earth.Food.Love is located at 101 High St, to find out further information check out their website www.thezerowasteshop.co.uk. You can keep up to date by by liking their Facebook page.